Every family has Christmas traditions. Some are cultural, some have been around so long we think they are cultural, some were bred out of circumstance, and some are so new we don’t even realize they are traditions until they are gone. For the past several years, I would take Christmas Eve off work and drive up to my grandmother’s house to help her with her Christmas baking. The baking was inevitably complete by the time I arrived. I was convinced that she woke up extra early that morning so that she could finish before I got there, keeping her recipes secret from me for another year. Kourambiethes have been my favourite treat since childhood: the ritual of dusting off the excess icing sugar, that first bite of buttery goodness melting in my mouth, the crunch of the first toasted almond. I rarely stopped at just one. Maybe because they were my favourite and maybe because she needed to feel needed, kourambiethes were the one cookie we never baked together. This Christmas was my first Christmas without my grandmother, and the first Christmas that I realized my drive to her house on Christmas Eve morning was a tradition that I will miss. I decided to start my own tradition, and woke up early on the morning of December 23rd (though not quite as early as she would have woken up), sorted through her recipe box until I found a card for “kourambiethes” in her distinctive cursive, and got to work. Like all her recipes, it was little more than a list of ingredients, but all those years in the kitchen with her paid off. I had been her helper long enough to know that the eggs went with the butter, the liquor was the last liquid to be added, and icing sugar could be re-sifted. So I set to work, combined ingredients in a way that made sense to me, and hoped for the best. What came out of the oven a little over than an hour later was better than I could have imagined. 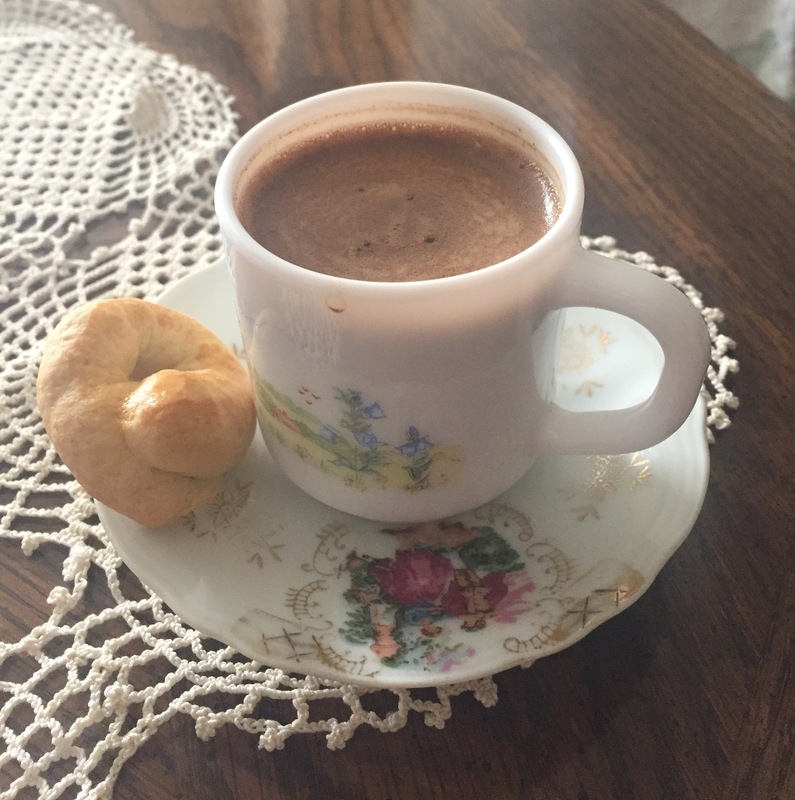 With the first bite, I was transported back to my grandmother’s kitchen, icing sugar falling on my sweater as I bit into a still-warm cookie, recognizing the taste as “yiayia’s recipe”. Her secret was safe with me. My grandmother loved entertaining. I grew up believing it was normal to have extended family over nearly every evening of the week, and that every house had an assortment of homemade cookies ready for children to snack on, and for adults to enjoy with their coffee. Everyone who walked through our door knew that they would leave well fed. My grandmother and aunts spent hours in the kitchen together baking, sharing, gossiping and loving every minute of it. As a small child, I sat in the kitchen with them drinking my milk and waiting impatiently to eat the warm cookies as soon as they came out of the oven. When I got older, I joined in. First I was assigned easy tasks: getting ingredients from the fridge, lining the baking sheets, rolling the dough in preparation to braid the koulouria. 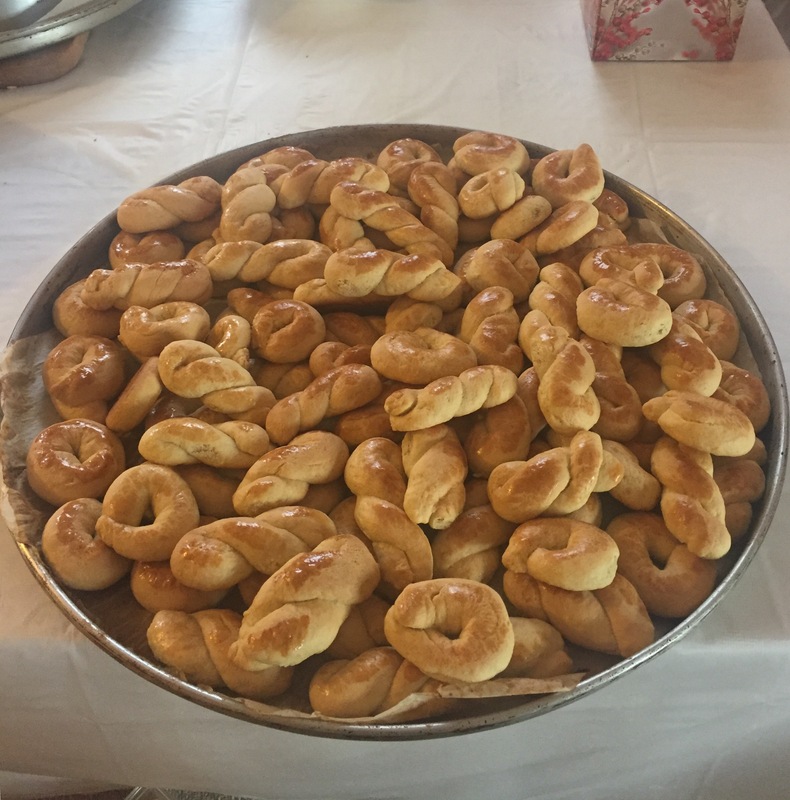 As I got more comfortable, my grandmother started to give me real tasks: adding ingredients, mixing until the dough was at the right consistency, actually braiding the koulouria, and watching them bake so I could learn to see when they were ready. In my grandmother’s later years, I started writing down every ingredient and instruction on whatever scraps of paper I had in my purse, and filing them away in my envelope of recipes. Here is the recipe I captured for Koulouria, braided Vanilla Cookies that were a staple in her house and often served with coffee. In a large bowl, mix butter and sugar. Add egg yolks and continue to mix. In a small bowl, whip egg whites. Once whites are frothed, add to batter. Use a dinner teaspoon (not a baking teaspoon) to scoop dough, roll and form a braid, and lay on baking sheet. Alternatively, you can form ovals, s-shapes or o-shapes. Remove from oven, let cool, and enjoy. Cookies store well in refrigerator for up to 2 weeks. I don’t remember exactly when I was given the recipe, only that I was. I was in yiayia’s kitchen helping her with her baking, and as she was putting one recipe card back in the box, she handed me another card for Basic Cake, saying: “This was your mother’s. Take it.” So I did. I took it home, put it in an envelope marked “recipes”, and left it there. It was valuable to me because it one of the few items I had in my mother’s handwriting. In a large bowl, combine flour, baking powder and cocoa powder. Add egg yolks and melted butter and mix. Pour half the batter into a baking pan (or two loaf pans), and sprinkle ¼ cup on chocolate chips (and 1 tbsp coconut flakes). Add remaining batter, and sprinkle remaining chocolate chips (and coconut flakes). The result is a tasty and moist chocolate pound cake. I have since successfully made vanilla, cinnamon and almond pound cakes. The variations continue, but at their core are the same 6 simple ingredients (I always skip the lemon “grind”). What variations will you come up with?